2 books in one that loops forever – resistance is futile! Bok Bok on the left, RDG on the right. I have made quite a few physical publications over the years, some of which are even still for sale at Blurb.com. Having conquered the physical world…hang on that sounds really bad…having made and sold more than a hundred physical books, I then spent 6 months of 2015 creating the Get In The Loop ebook (thanks to everyone who bought it!). Back to the physical world, it has been quite a while since I last created something printed and there is just nothing like a physical publication no matter how good screens get. Moving around all the time means it is hard to find the time and to receive mail actually, but enough excuses. I finally produced a new publication – the publication that never ends because it is a LOOP! My idea was just initially to test out the Digest format at Magcloud.com. My good friend Daniel Milnor of Shifter.Media fame has been raving about the Digest format for a long time, and it seemed the perfect size for a small portfolio folder featuring my music photography. The titles of the two parts of the book, TechnoColour and TechnoNoir come from series of images I have been posting on my instagram. I wanted to feature both colour and black and white work and somehow I ended up with the idea of making a book that you could loop – a little folder that, when you reached the middle, the book would be flipped so you’d just rotate the book and start from the other end and it is a whole new book! Then when you reach the middle again, repeat, loop the book, and especially if you have the memory of a gold fish you can keep going forever and you will be surprised every time! That way you have two books in one, one section with colour, one with black and white. I put the book together in a couple of evenings, looking at my screen upside down to check the flipped half of the book (this actually works and a bonus is the rush of blood to the head!). I planned to give a lot of these away as a sort of extended business card during the festival season in Copenhagen so I ordered 25 copies – with shipping costing a lot more than the digest book, to make it worthwhile I skipped ordering a proof copy (not recommended) and just hoped that I had designed and proofed the book correctly and the LOOPing would work (it does!). I am really impressed with the print quality, the semi-glossy paper is great and the colours are spot on. The digest size of 21cm x 13.3cm (8.25″ x 5.25″) is great for this purpose, small enough to handhold and loop easily. The book has an intro (twice heh!) but I did not add captions to the images, this is a pure portfolio and I just wanted the image to fill 100% of the pages. 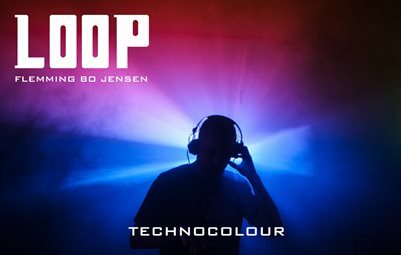 Thank you so much to all the artists depicted in LOOP, the TechnoColour colour is of RDG and the TechnoNoir cover is Bok Bok. Others featured are Kölsch, Bambounou, Courtesy, Isolee, Bas Under Buen, DJ Shaq, Roskilde Festival, Skipper Røvskum, Tim Driver, Pernille, Choir of young believers, Questlove, Copyflex, Minds of 99, MØ, SGT Pokes, Kasper Marott. I am definitely making more! Buy a LOOP for yourself and support my coffee addiction! PS. Don’t blame me if you end up awake all night LOOPing this magazine over and over. It is addictive. Next post Strøm festival + running the Phototeam – can I do this forever please?